This Place of Worship was founded in 1802, but we understand it was closed in 2002. "Brook Street Baptist Chapel founded 1803, but the Church assembling in this Chapel formed 1791" [note at the beginning of the chapel's register - see Blanche Charles's account of East Midlands General Baptist History. Baptist doctrines were first introduced to Derby in 1789, when the Rev. Dan TAYLOR preached his first sermon in Willow Walk, close to this site. The chapel was built in 1802, and rebuilt 1814, but in 1830 a secession in the movement resulted in another chapel being built in Sacheverel Street, whilst the original church removed in 1842 to "a large mansion house in St Mary's Gate ... built in 1750 and converted to a chapel by James FENTON of Chelmsford". Derbyshire Record Office's Non-Conformist Register Guide adds the original congregation was founded in 1791, and that the chapel in St Mary's Gate was closed in 1937. Its Baptist congregation then moved to the newly built Broadway Baptist Church (qv), outside the city centre. After the Baptist congregation left the Brook Street chapel, it passed to "one of the Wesleyan Reform Societies then in dispute over the proposed erection of a chapel in Becket Street", and it has since then, and until recently been in Methodist use. 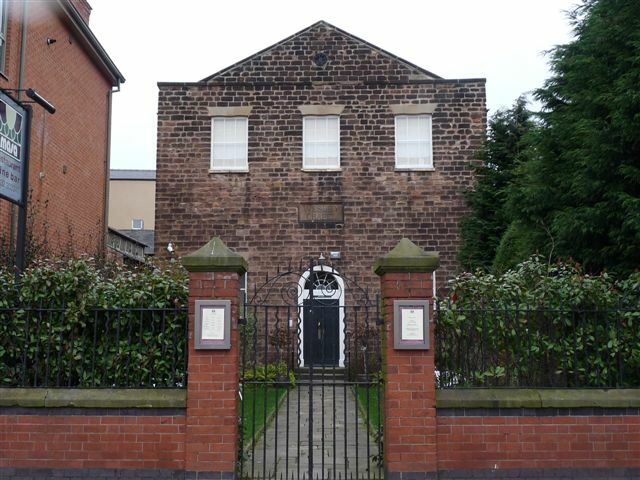 The building has "a front of squared stone of three bays with a narrow pediment, round-arched doorway and two tiers of plain windows... a tablet above the entrance is now inscribed 'WESLEY CHAPEL'". The rear faces Willow Walk, where it can be seen from Google 'Street View', with a sign saying the premises are now (2010) occupied by Masa restaurant Wine Bar. There is a history of the chapel on their website. Now or formerly Baptist/Wesleyan Methodist. Brook Street General Baptist Chapel, Derby shown on a Google Map. I have found many websites of use whilst compiling the information for this database. Here are some which deserve mention as being of special interest for Derby, and perhaps to Local History and Places of Worship as a whole. Information last updated on 4 Dec 2010 at 20:12. This Report was created 3 Apr 2019 - 15:16:35 BST from information held in the Derbyshire section of the Places of Worship Database. This was last updated on 6 Feb 2019 at 15:49.